We’re getting far into the holiday season. We here at Diet Doctor invited four interesting LCHF celebrities to share their best tips and recipes for holiday treats without excessive amounts of bad carbohydrates. 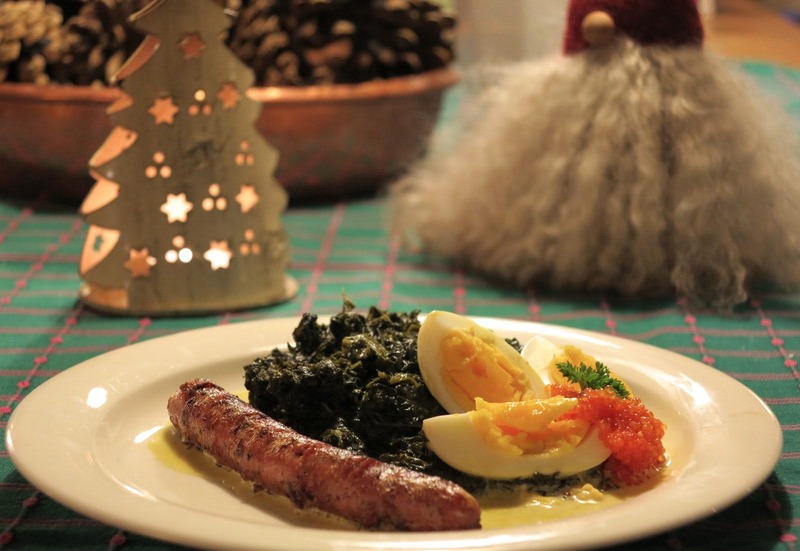 Our fourth holiday-season host is the incomparable Swedish LCHF pioneer and cookbook author Sten Sture Skaldeman, here with his recipes and thoughts on holiday food. This is the fourth Sunday in the Advent fast. In much of the Christian tradition fasting lasts through Christmas Eve. This means that meatballs, spare ribs and ham are not allowed on the fourth Sunday in advent, but the traditional Scandinavian dish, lutefisk, is fine. Those not so inclined, who wish to, may instead observe the old Scandinavian holiday tradition where most things are allowed. 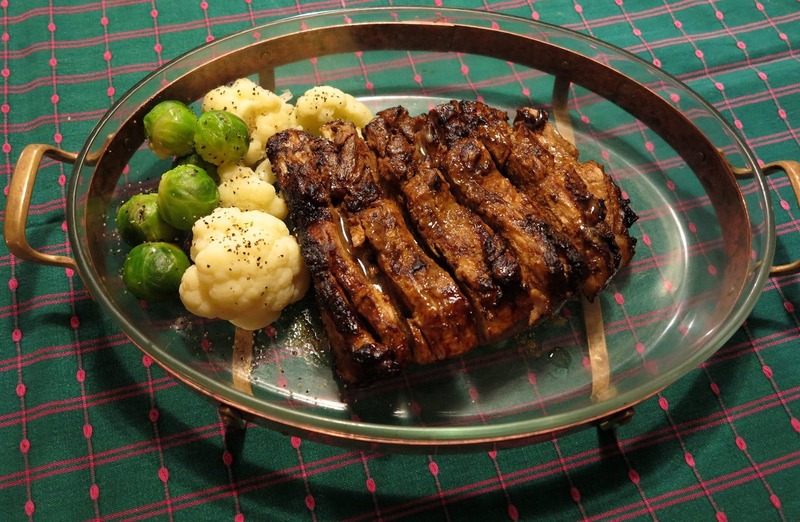 Or you can eat LCHF with spare ribs and pork all year round! Some have commented that there was too much baking (although with almond flour) in the other holiday guest posts. Skaldeman treats us to a nice contrast! There’s no need to eat unhealthy foods just because it’s the holiday season. Therefore, breakfast will still be the same, i.e. bacon and eggs. Or just pork and eggs if you want to eat like a viking. For people who don’t like pork in the morning I suggest a shrimp salad. I eat kale all year round, either from my freezer or from my little cabbage patch. Kale is a nutritious and tasty plant, which contains great vitamins and minerals. Kale is a great choice for those who think that fiber is healthful. Creamed kale is kale in butter and cream. I usually boil fresh kale in bone broth until soft, chop it finely and put into freezer bags. When I want some I just thaw a bag, fry up the kale in butter and add some cream. I then spice to taste and let everything boil together. Creamed kale makes for an excellent side dish with meals outside the holiday season as well. You might find frozen chopped and blanched kale in the grocery store. Thaw, steam off the liquid and do as above. This Sunday I’ll have creamed kale for lunch, together with lamb sausage and boiled egg halves with caviar. A great holiday primer. 1/2 pound (200 gram) of finished creamed kale contains about 250 kcal and 4 g carbohydrates. A whopping 88% of the energy content comes from fat and the fat amount relative to carbs and protein is over 3.0. Creamed kale is proof that there are healthful vegetables. The trick is just to add fat! It’s almost winter where I live and time for stews and slow cooking. I’ve started to use my old clay pot again, but instead of cooking at 500°F (250°C) for two hours, I cook at 200°F (100°C) over night. So I start cooking the night before. The result is pulled pork, if you’re using a cut from a pig. I have beef on my plate in the picture. Whatever you cook, it will be tender and juicy, and it actually is easier than frying fish sticks! I rub the meat with spices of my choice, place it in a damp clay pot and heat the oven to 200°F (100°C). Then I go to bed. The food will take care of itself. The meat is done when it can be pulled apart with a fork. It usually takes ten hours in my oven. Serve with above-ground vegetables and butter. When the pulled meat is ready I throw spare ribs in the oven. At 400°F (200°C). This is mandatory food for my holiday season. Spare ribs and pulled meat will be my Sunday Advent dinner. The fourth Sunday of Advent and the old viking midwinter celebrations coincide in time. Thus, we can choose if these days are going to be the start of our new healthy life or a continuation of our junk-food eating. Have you thought about how holiday food is health food? The traditional Swedish Christmas food is a national treasure. It’s nutritious food, filled with healthy fats and free from a lot of the easily digested junk that we eat everyday. There are uninformed people who worry about what the holiday food will to do their health. They listen to calls to remove the fat from the ham and to avoid anything that has to do with old traditions. However, the people who ate those traditional holiday meals were not obese, and they only had a fraction of today’s modern diseases! If we have a recipe for health it would be to eat like grandpa and grandma did! Why not take the plunge and start prioritizing your health seriously? The easiest way to do this is to reintroduce traditional Scandinavian Christmas traditions. And let the holiday customs follow you through-out the rest of the year. Skip lean ham from a tortured pig, skip the low-fat labeled food and artificial fats. Bring out grandma’s old cookbook and eat what we ate a hundred years ago. You’ll be satisfied and escape all these blood-sugar swings and “cravings” that are poisoning the daily lives of so many. Eat Yourself Slim and Healthy on Real Food! Fifteen years ago, I launched my own health journey. I discovered what is now called LCHF and started to eat traditional Scandinavian food all year round. The food that people in northern Europe ate before the agricultural revolution. With the help of this traditional diet I went from severe illness to perfect health. As a bonus, between 132 and 154 pounds (60 and 70 kg) disappeared. Conclusion: The fat holiday pig is health food! And it’s great to eat it all year round. Don’t believe the food industry lackeys, who are saying that you should eat a lot of bread and beware of fat. Eat like our ancestors did. If you do, this holiday season might just be the start of your own health journey! But What About the Gingerbread Cookies? Of course, feel free to decorate the holiday table with as much junk as you wish. Candy, gingerbread cookies, figs, oranges, potatoes, beer and bread. But only view them as decorations. If you eat the decorations you’ll impair your health and probably gain weight. If you think that it’s worth it, go for it. I myself made one exception this fourth Sunday with some pickled herring. This is sugar-loaded food, but midwinter holiday is only once a year! Thank you to our fourth holiday-season host! What do you think about the tips? Please feel free to leave a comment here. I'm not personally a fan of baked goods... especially when the recipes have to be tweaked with faux-flours and sweeteners; to make a reasonable facsimile of what we might have eaten previously. I am a fan of real whole food and there is so much out there on offer, that just a little imagination means we can eat to be healthy and satisfied. This is why I don't follw the reasoning of "food reward" or the suggestion that food needs to be bland or we will overeat it... that is NOT living in my book. 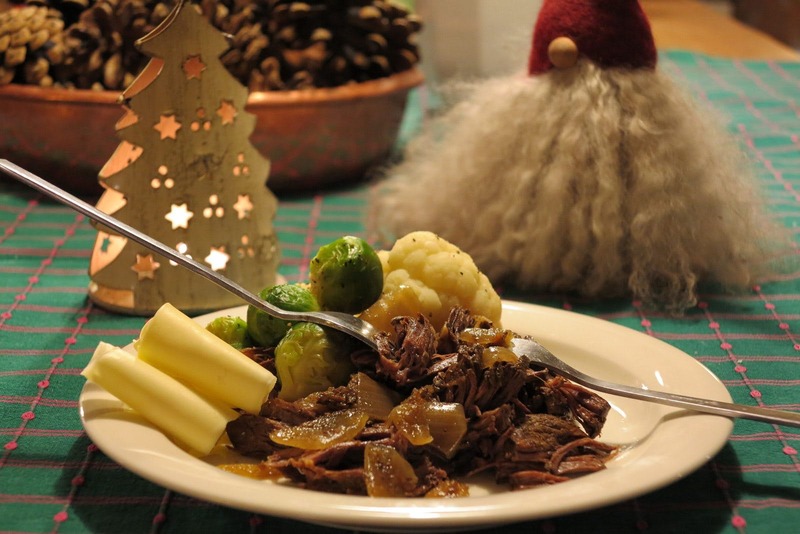 I am using some of our traditional Danish Christmas recipes - this year without guilt. I've been lchf for nearly 3 months now and loving it. No weightloss as yet (sigh) but feeling the health benefits since changing - IBS has settled, reduced swelling in knees and strong hair/nails. So much good whole food on offer. Not missing the bread and sweets at all. It can be quite a challenge turning on the stove/oven at Christmas and cooking traditional Nordic food in 35-40 degrees (Celcius), but tried Sten's cream Kale today - rich in flavour and so delicious!! Lise, in Aussie they use crockpots/slow cookers a lot. Works just as well, if not better than an oven. I learned to use them, when visiting my brother in Aussie. Luckily they are becoming more readily avaIlable in Europe. I make bone broth in the slow cooker. And stews. Even par boiled rice in the slow cooker (and cooled for the resistant starch).